Almost every Sunday, we frequent Starbucks Banawe after church so it was pleasant to know that there’s a new go-to place a few blocks away. I’m talking about 238 Banawe. 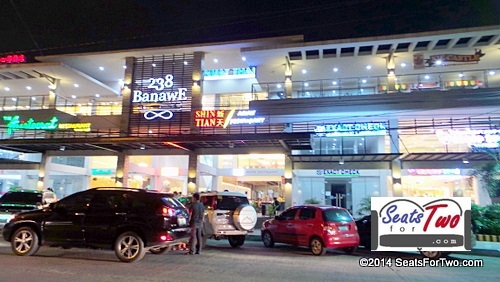 It’s a new mall located at Panalturan corner Pagataan streets in Quezon City. It’s also the new home of a restaurants King Chef and Aristocrat. We’ve been hooked to having massages recently; and last month, I’ve had several trips to the spa. About a week ago, my aching body called for a good body massage and the nearby Nuat Thai Banawe branch seemed perfect for the occassion. 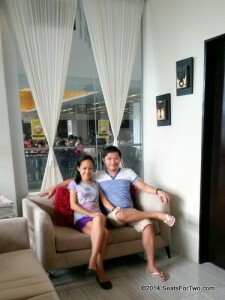 Upon choosing the services that piqued our interest, we asked some questions since it was our first time there. It’s good to know that the receptionists were kind enough to answer our inquires including what happens during a body scrub and what are the herbal balls included in the aromatherapy massage. It’s our first time ever to have a body scrub, and the herbal balls thing was new to our ears as well; more about it down the article. The therapists started the rituals by washing our feet using warm water and sea salt scrub. I appreciated that they have a separate room for washing the feet on a lowered lavatory. Next, we were led to a couple’s massage room and were given time to settle in. Technically, we had the body scrub first, then the aromatherapy massage followed. We choose the Moroccan salt scrub over the Almond Milk Scrub for no reason at all. We’ll be more than willing to try the latter next time. But the receptionist told us that the Moroccan salt scrub is stronger in taking off dead skin cells while the Almond Milk scrub suits people with sensitive skin. So I guess now, you know what to take. 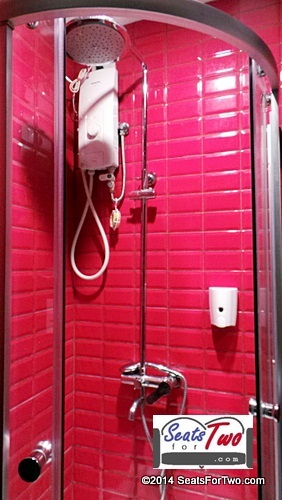 For showering, Nuat Thai have a pretty red shower room with hot & cold water, and liquid soap. 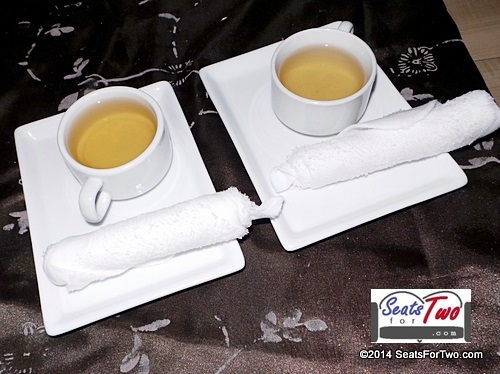 Back in the massage room, we were served with hot tea before the next ritual – Aromatherapy Massage with Herbal Balls. There were three types of oil to choose from. The options are lavender, green tea and eucalyptus, we choose lavender for its relaxing effect on the muscles. Moreover, and more specially what made this aromatherapy massage special, is the use of herbal balls. Herbal balls contains various dried herbs wrapped in a clothe and tied into a ball. It’s a Thai massage technique. The masseuse carefully applies pressure by pressing the herbal balls on areas of the body that are stressed and aching such as the shoulders, the lower back area, and buttocks. I’ve read that herbal balls have been used in the ancient healing system particular for body massage. It is used to relieve pain and inflammation as well as induce relaxation. It can also help smooth skin as dead cells are removed, and improve blood circulation as well. It had a familiar scent we weren’t able to immediately recognise. And then we concluded that it must be a mix of various herbs. 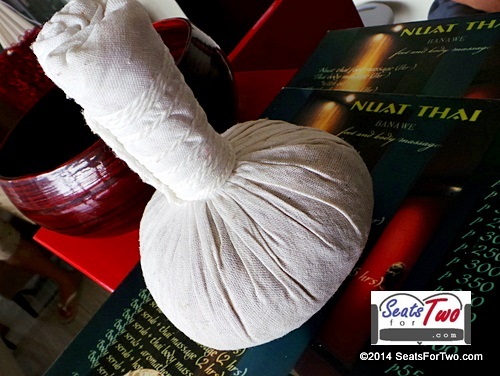 I’ve been to several spas but it was only at Nuat Thai where I experienced being applied a warm compress. The friendly masseuse placed these hot compress on our nape and lower back, very relaxing! The body aches and muscle pains were now relieved. We almost fell asleep when they started the third ritual – foot reflexology. It was done by gently applying pressure on the sole of our feet while massaging. The masseuse also utilised a wooden stick, traditionally used in Thai massage/spas. In the process, I felt a mild but tolerable pain as she applied pressure using a wooden stick. The ritual lasted about an hour. It was concluded with lotion and the covering of our foot with a red cloth. The hands of the skilled massage therapists removed our muscle pain and its stiffness. We think it was a great pampering treat having three types of treatment in one afternoon; and in the company of each other. Nuat Thai Banawe has 10 treatment rooms. Offering several foot and body massages, hot oil massage, Thai back massage, Swedish, Aromatherapy massage, hot stone massage, and body scrub. 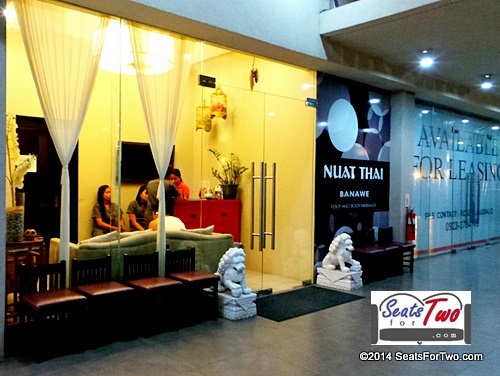 Nuat Thai also have branches in Eastwood Libis and Pioneer, Metor Manila. What’s the best massage you’ve ever had so far? Feel free to share in our comment section below. Gardenia’s Search for “The Next Big Sandwich Hit”! how much is the massage? Is the foot massage included at the rate of P350? Good day mam. How much its cost all of your massage?